Whilst there are several different options available for filtering water the best choice for a marine aquarium is almost always the protein skimmer. Otherwise known as foam fractionating, the skimming process enables you to dispose of waste without disturbing the balance of nutrients needed by corals and without the risk of clogging up and polluting your substrate. But how should you go about choosing the right skimmer, and what do you need to bear in mind when setting it up? The most important consideration is the size of the skimmer required to keep your aquarium clean. You should be aiming to process at least one tankful of water per hour, with an equivalent amount of air. Not all skimmers are sold with strong enough pumps and you may need to experiment before you can determine exactly what your tank requires. Don't be tempted to save money by buying a smaller pump which will do an inadequate job. Do bear in mind that a strong pump also produces hat, so you'll need to monitor and adjust the temperature of the water in your aquarium as you establish your skimmer. Protein skimmers work on the principle that free-floating and dissolved pollutants in water stick to the surface of bubbles. An efficient skimmer needs a concentrated column of small bubbles (enough to make it look white) which carry particles of waste up to the surface to form foam which can be skimmed off. This process also helps to dissolve more oxygen into the water for your fish to breathe. You will be able to tell when your skimmer is working properly because the water in your aquarium will be crystal clear, with no yellowish discolouration. Skimmers run most efficiently in water with high specific gravity. This means that the saltier your aquarium water is, the more foam will build up on the surface to be skimmed. Bear in mind that if you reduce the salinity of the water as part of a disease treatment you may need extra filtration in the meantime. Venturi Driven Protein Skimmers - Using a powerful pump to force air bubbles through the water, these are compact and fairly simple to use, though they do need to be cleaned every few days and may occasionally clog up with stubborn mineral deposits. They can be expensive to run. Counter-Current Air Driven Protein Skimmers -These skimmers require an air pump, a water pump, and air stones to lift pollutants up to the surface of the water. This can be expensive to set up and the air stones will need to be replaced every few months, but, if run properly, the system is very efficient. It is also comparatively kind to plankton. Needle Wheel Skimmers -These combine the venturi and counter-current air drive methods. They produce very small bubbles, making them highly efficient, and they are relatively compact. Down-Draft Protein Skimmers -Also known as ETS skimmers, these use high pressure jets of water pumped through bio-balls. They are simple to construct but can be expensive both to set up and to maintain. However, they are extremely powerful, making them a good choice for densely stocked tanks or tanks with pollution-sensitive inhabitants such as anemones. Spray Induction Skimmers - Extremely compact and easy to set up and maintain, these are expensive to buy but have reasonable running costs. They work most effectively with the addition of an automatic waste container. All skimmers need to be cleaned from time to time to ensure that they're running efficiently. 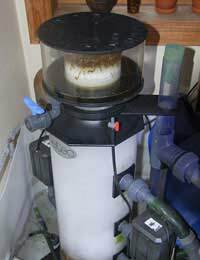 Often the first sign that your skimmer is failing will be a build-up of algae on surfaces within the tank. Different models of skimmer vary widely, even within the parameters described above, but when you're buying one you should check to see how easily it can be taken apart for maintenance. Protein skimming requires a serious investment of both money and time if you want it to work properly, but it's essential to running a really successful marine tank. Once you have a good skimmer established many of the problems associated with salt water fish keeping will disappear. You'll soon wonder how anybody ever got by without one.